2K Sports has retained its place atop the basketball simulation throne, and it looks like they’ll stay there for a while. The publisher proclaimed in a press release today that it has sold more than two million copies of NBA 2K10 worldwide, a 60% year-over-year improvement for the same October-through-January time frame (2K10’s sales increase was likely helped by its Wii and PSP versions, which did not exist for NBA 2K9). These sales numbers are all the more impressive for having come amid what was, by most accounts, a strong effort from EA in NBA Live 10 (albeit one that sold even fewer units than NBA Live 09). But after being there and spending some time over at EA, it was clear that they do things a different way, and in a way it’s just inefficient and just not the place to be to make the best games. [...] With some of the creative decisions over at EA, it just made it difficult to stay there. They just want to make a different game than I had a vision for. [...] For me, it was interesting to be at EA, but it was just hard to get stuff done. ... [N]ow they want to change things in a great way because they can’t afford to sell this many units through a three-year plan or a five-year plan. [...] I think EA is going through an identity crisis with their basketball sim. For its part, EA announced Wang’s departure first, perhaps hoping to soften its impact. NBA Live lead producer Sean O’Brien, in a post on the series’ In the Paint blog, left Wang with thanks and well-wishes. But this is a serious blow to EA’s basketball street cred, and it raises questions about the future of the NBA Live games. 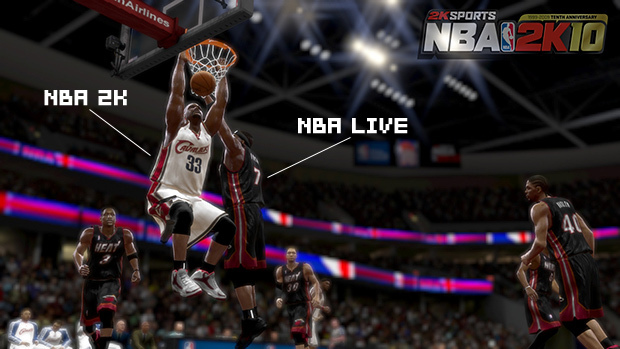 It’s hard to imagine a world without NBA Live, especially since (unlike baseball or football) there’s no NBA license exclusivity, but perhaps EA is going in an arcade direction with its basketball games -- and maybe the NBA Jam revival is the start.